Anthracnose is a fungal disease that attacks plants and trees, and it’s very serious. This type of fungus comes out during the wet, cool spring months, and although it can affect a variety of shrubs and trees, its main threat is to dogwoods. 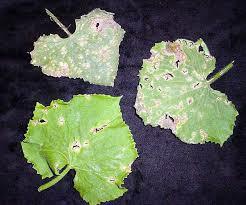 Other trees that can suffer from anthracnose include maples, oaks, sycamores and ashes. Since this fungal disease can be fatal, it’s important that you know what the signs and symptoms of the disease are so that you can act fast if your trees were to fall victim. What are the Signs of Anthracnose? The first signs appear on the leaves of the tree, along the veins. If you pull the leaf up and look underneath the vein, the vein will be black. There will also be dark lesions along the veins, and you may notice some spots in between the veins as well. In the initial stages, the leaves will stay intact, but eventually they will fall off the trees. As the disease runs its course, there are other signs to notice as well. The infestation will affect the twigs and branches as it moves from the leaves. The twigs and branches will show discoloration. In severe cases, the anthracnose can travel through the branches and kill them off, but this is generally not a common end result. Finally, on a tree like the dogwood that sprouts flowers, anthracnose can cause the flowers to look deformed. Anthracnose is a type of fungal disease, which is why it thrives in cool, moist conditions. Basically, this fungus starts to spread in the cool weather and takes hold of the tree. One of the most common reasons why this fungus appears in the first place is because of old leaves, twigs and branches that sit around the tree and become damp and wet over the winter months. It can be easy to forget about the small tasks of picking up leaves and sticks during the fall months, but there are important reasons for doing so. When the spring season sets in, the fungus is then spread by the wind and rain. It can also be spread during irrigation. How Can I Treat Anthracnose? Fortunately, there are many effective ways to protect your trees from anthracnose. First, make sure that leaves, twigs and branches are picked up from your yard, as these become great places for mold to harbor. Keep an eye on your trees at all times to ensure they are growing healthily. Also choose smart places to plant trees, such as in areas where they will be exposed to sunlight. Trees that are heavily shaded tend to stay wet for longer periods of time. If you do notice signs of the disease, prune out infected branches and twigs. A preventative treatment program is effective when done in the early spring before the buds of the flowers open. Also bear in mind that trees suffering from drought, nutrient deficiencies and other diseases will be more susceptible to anthracnose. Most of all, be patient, as most trees can recover naturally from anthracnose. They may look a little plain and scraggly, but eventually, new leaves will grow in and fill out the tree. This is the natural defense system of a tree, and part of the glory of Mother Nature. Should I Worry about the Rest of my Garden? Although anthracnose can be tricky to get rid of, you don’t have to worry about it taking hold of your entire backyard. The infection is host-specific, which means it won’t necessarily travel to other hosts. However, you should be taking care of your other trees and shrubs to prevent them from coming into contact with the fungus. The bottom line is that the sooner anthracnose is treated, the better off everything else will be.